In the mid-1970s, after the conclusion of the Vietnam War, the United States Air Force began accepting young women as pilot trainees. The destination for the women who successfully completed undergraduate pilot training would be primarily into the Military Airlift Command, where they would take their place in the cockpits of military transports and light utility jets. The women who entered the world of military airlift were following in the footsteps of another generation, the women pilots of the Womens Auxiliary Ferrying Service and the Womens Airforce Service Pilots of World War II. The possibility of using women as Army pilots had been suggested as early as 1930, when the War Department sent a query to the Air Corps suggesting their possible use. The proposal was promptly rejected by the Chief of the Air Corps, who replied that the possibility was "utterly unfeasible" due to women being "too high strung for wartime flying." Ten years later, in 1940, the Air Corps Plans Division proposed the use of approximately 100 women pilots as copilots in transports and for ferrying single-engine airplanes. General Henry H. Arnold, the Chief of the Air Corps, turned down the proposal on the basis that it was unnecessary. Still, the idea would not go away as various proposals for the use of women in military roles were presented to the US government from outside the Air Corps, and often from outside the military. In 1939 noted aviatrix Jacqueline Cochran wrote a letter to the wife of the president, Mrs. Eleanor Roosevelt, suggesting the need for the planning of the use of female fliers in a national emergency. Cochran advocated that the use of women in auxiliary roles would free male pilots for combat duties. In 1940, before the United States went to war, the Army Air Corps established the Ferrying Command, an organization responsible for flying US-built airplanes to points where they could be delivered to ferry pilots from the countries who were allied against the Axis powers in Europe. Initially, the Ferrying Command depended upon the Air Corps Combat Command combat squadrons for the pilots to make the flights, on the basis that the long cross country flights from the American West Coast to the East Coast and Canada provided valuable training experience that the crews could take back with them to their squadrons. But when Pearl Harbor plunged America into the war, the combat pilots were needed to staff the under-strength fighter, bomber and troop carrier squadrons which would fight the war so the Army contracted with the national airlines and other civilian aviation companies to take over some of the ferrying duties. In mid-1942 Ferrying Command became the Air Transport Command, with the ferry mission placed under the Ferrying Division, commanded by Colonel William H. Tunner. In June, 1940 the Ferrying Command had been authorized to employ civilian pilots with significant flight experience, but the practice was still untried when America went to war. Right after Pearl Harbor the Army began recruiting civilian pilots, and by the end of January, 1942 343 civilian pilots with backgrounds in non-airline civil aviation had been assigned to ACFC's Domestic Wing. The men, all of whom had a minimum of 500 hours of civilian flight time, were employed on a 90-day temporary basis. If found qualified to fly military aircraft at the end of the probationary period, the men were offered commissions as service pilots, a qualification somewhat lower than that required for combat pilots. The amount of flight time required was lowered to as low as 200 hours for a brief time, but by 1944 had been increased to 1,000 hours. The need for civilian trained pilots was within the Air Transport Command, and particularly within its Ferrying Division. Mrs. Nancy Love, an experienced pilot herself, was employed with the Ferrying Division of the ATC in a non-flying position. As the supply of experienced male pilots dwindled, Love proposed the recruitment of the most qualified women pilots in the nation to assist the ATC' s Ferrying Command as civilian employees. 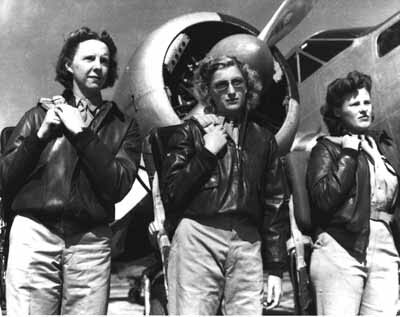 Love's proposal was adopted in the summer of 1942 and 25 female pilots were recruited to become members of the WAFS, with Nancy Love as commander. 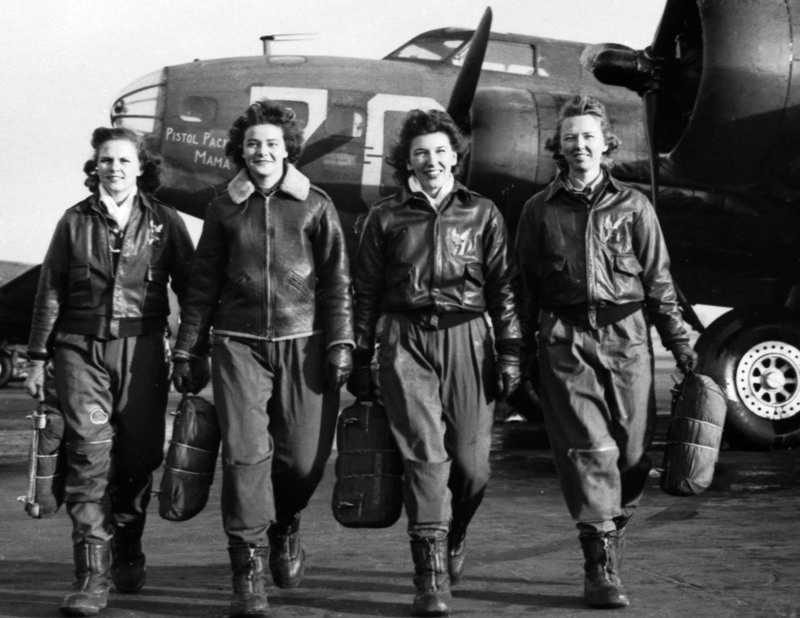 Each of the women had more than 1,000 hours of flying time and they quickly proved capable of the kind of duties for which they had been envisioned. Originally assigned to fly single-engine light airplanes, the women demonstrated that they could handle fast pursuit ships as well as four-engine bombers on transcontinental ferry flights. In July, 1944 303 women pilots were on duty with Ferrying Division, the most ever assigned, but the numbers dropped o to an average of 140 as women with less experience and those lacking in competency were transferred to the Training Command for other duties as the demand for light trainers decreased and fighters became the primary airplanes to be delivered. While Love's pilots were highly experienced aviators, Jackie Cochran had another idea in mind. Using her influence with Eleanor Roosevelt, Cochran convinced the War Department to create the Womens Flying Training Detachment, a program to train young women with limited flying experience as pilots, with Cochran as director of the program. Essentially, the mission of Cochran's program was to turn out female pilots with the experience necessary for a commercial pilot's license. Consequently, the military found itself with two programs using female pilots, one a valuable asset that took advantage of the skills of experienced women who could make a significant contribution from the outset and the other a politically motivated program requiring extensive training before the women could be productive. General Arnold called a meeting of officials from ATC and Cochran and told them there was not room for two programs - they would have to get together. Cochran's political connections allowed her to prevail and her plan was adopted. Cochran also used her political influence to gain command of the program. On August 5, 1943 the WAFS and WFTD were merged to become the Women Airforce Service Pilots, or WASP, with Cochran as Director of Women Pilots. Nancy Love was made WASP executive officer with the Ferrying Division of the ATC. The WASP program was not a military program but was rather an auxilary and the women had no military status. They were civilian employees of the Army Air Forces. No comparable program was set up to train male pilots for civilian employment. The two principles in the establishment of the women's flying program were Jackie Cochran and Nancy Harkness Love, two accomplished female aviators whose lives and personalities could not have been more different. Love grew up in Michigan as a doctor's daughter then attended Vasser College. She learned to fly at age sixteen and wanted to be involved in aviation. After graduating from college she married Robert Love, who held a commission in the Army Reserve, and the two of them opened their own aviation business in Boston in which Nancy worked as a flight instructor and charter pilot. She also did some work for the Department of Commerce and was an accomplished test pilot. Before the Lend-Lease Act was adopted, US pilots weren't allowed to make deliveries to warring nations, including Canada. The aircraft manufacturers contracted with US civilian pilots to fly their products to airfields on the Canadian border, where the airplanes were towed across the border. Nancy Love flew several flights as a contract pilot. 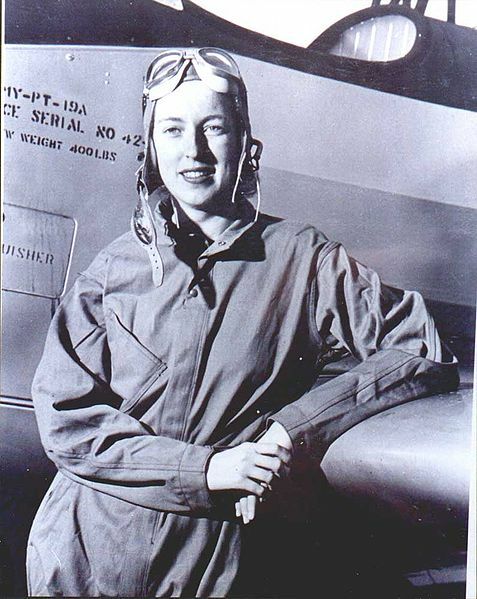 Cochran was also an accomplished pilot, but her accomplishments, like those of Amelia Earhart, had been purchased using her husband's assets and connections. An ambitious and power-hungry woman, who could also be called "conniving," she seemed most interested in self-promotion and power. Jackie Cochran wasn't even her real name. Her real name was Bessie Lee Pittman and she had been raised as a sawmill worker's daughter in Lower Alabama and the Florida Panhandle. Cochran was the name of the young US Navy enlisted man, an aircraft mechanic, she married as a teenager as a means of getting away from home. She concealed her true identity for all of her life. Although some of her relatives lived with her in California, she claimed they were employees and her "adopted family." After her divorce, she left the South for New York City where she used her good looks to land a job as a countergirl at Saks Fifth Avenue. While working at Saks she met and seduced Floyd Odlum, a wealthy financier, who was married at the time. Odlum left his wife and married Pittman, who had kept her married name of Cochran, but had started calling herself "Jackie." She convinced Odlum to finance her in the cosmetics business and buy an airplane to travel around the country. Eager to make a name for herself, she began competing in air races. While Love's idea was to make the most efficient use of the nation's female pilots, Cochran wa seeking to further her own ambitions. Her goal was to become head of a military corps of women pilots. She is alleged to have extracted a promise from Air Corps Commander General Henry H. Arnold that he would not utilize women in any way unless they were commissioned as officers and that he would consult with her on any actions involving female pilots. She went to England and joined the British ferrying service, which employed women as well as men. When she learned that Love had been appointed to head a squadron staffed by female ferry pilots, she was incensed. She left England immediately and proceeded to Washington where she confronted Arnold in his office. Arnold pacified her by setting up a women's training organization under her command. After a year with two organizations, Cochran managed to gain control of all female pilots employed directly by the Army. Nancy Love, who Cochran evidently percieved as a threat, became her subordinate. That women could supplement male pilots was apparent in 1942-43, when the war was still going against the Allies and the War Department believed there would be heavy casualties among the males pilots who went to war. As some of the women demonstrated superior abilities, General Arnold directed that training in heavier and more difficult airplanes be initiated "to the maximum extent possible." In 1942 Arnold wrote that the Air Force's objective was to replace as many male pilots in non-combat flying duty with women as was feasible. Cochran's training program did not lack applicants. Advertisements over-glamorized the program, leading to a flood of applicants as more than 25,000 women applied for WASP training. Only 1,830 were admitted of which 1,074 completed the training. The training program began initially at Hughes Airport - now Houston Hobby - in Houston, Texas, but moved to Sweetwater, Texas due to lack of facilities. In the first months of the program, when training standards were relaxed, the wash-out rate among women was 26% but increased to 47% in 1944 when the lessened need for pilots allowed more stringent requirements. Still, the comparison to men was favorable as the washout rate for men went from less than 25% to more than 55% over the same period. The second woman hired for the WAFS was Cornelia Fort, a Nashville socialite who had already become a celebrity because of where she was on December 7, 1941. (The first hired was Betty Gilles, whose husband was an executive with Grumman Aircraft on Long Island.) After graduating from college, she returned to Nashville, where she learned to fly. She moved to Hawaii and took a job as a flight instructor at Honolulu. On the morning of December 7, she was in the air with a student pilot when the first Japanese aircraft appeared in the skies over Oahu. As soon as she realized the mysterious aircraft had hostile intentions, she returned to land. A Japanese fighter strafed the airfield immediately after she landed and killed her boss, Bob Tyce. After the outbreak of war, civilian flying in Hawaii was suspended so Cornelia returned to the US where she did a war bond tour and made a movie. Nancy Love contacted her in September, 1942 and offered her a job with the WAFS and she immediately accepted. By March, 1943 she was flying out of Long Beach, California ferrying Vultee BT-13 and Ryan PT-19 and PT-22 trainers. On March 21 she was flying as part of a formation of BT-13s that were on their way to Texas. The formation was mixed, with both male and women pilots. Women writing about the WASPS have claimed that the male pilots started teasing her, and began making simulated combat passes at her airplane but this assertion is not borne out by eyewitness accounts. Evidently she and another pilot, an Army flight officer, got too close and their airplanes collided. Both crashed and both were killed. Cornelia Fort thus became the first female pilot to die while in Army employ. Initially, the WAFS ferry pilots were assigned primarily to the movement of light aircraft - trainers, liaison and light utility transports. But as they proved their competence, some women were allowed to move into more sophisticated airplanes. 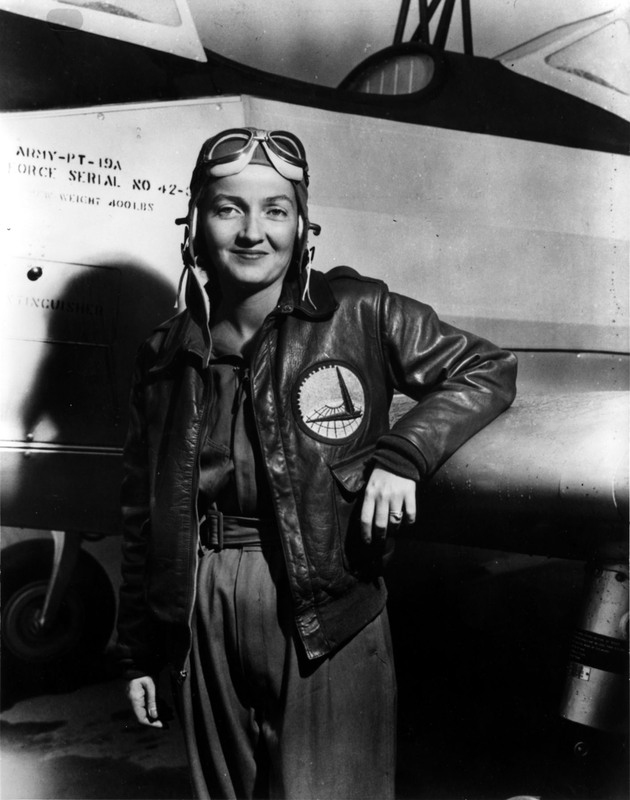 Betty Gilles was the first WAFS pilot to check out on the P-47. The Ferrying Division had an advancement policy that started out male pilots in light airplanes them moved them into domestic ferrying of four-engine bombers in preparation to their assignment to overseas ferry and transport routes or to overseas duty with the Air Transport Command, including on the perilous routes into China. The men were brought into the Army as commissioned officers and flight officers and designated as Service Pilots on the basis of their civilian flying experience. The women were civilians and had no military status; they were awarded no military aviation badge. (Cochran designed wings for the women and had them made, but they were not Army badges.) As Civil Service employees, the women were not subject to overseas duty. Consequently, as the women gained experience, they gradually moved into the domestic ferrying of fighters which, because they were high-performance tailwheel aircraft (except for P-38s and P-39s), were more difficult to handle than bombers, most of which were equipped with tricycle landing gear. By the summer of 1944 the ferrying of fighters had become the primary WASP activity within the Air Transport Command. The accident rate among pilots ferrying fighters, both male and female, was much higher than with other types although only four women were killed in fighters. In fact, all but nine were killed in trainers. This has led to the myth that the women were given more difficult assignments then the men with whom they worked, which while partly true must be taken into context. Women were ferrying fighters, not because they were more difficult to fly, but because they did not fit into the training program for male military pilots who were destined for overseas duty and who were assigned to ferry multiengine airplanes to gain experience before being assigned to transport squadrons. Women in the Ferrying Division received well-deserved praise from their superiors, including General Arnold, who stated that commanding officers preferred WASP pilots to deliver their airplanes because the women usually reached their destination a day or two ahead of the men. This was because men tended to stop off to see girlfriends while the women did not carry an address book! A widespread myth relates that female pilots ferried half of the high-performance combat aircraft ferried within the Continental US. Apparently started from an article written by a former WASP about Nancy Love, such a number as reported is impossible. More than 60,000 fighters were produced in 1943 and 1944, the two years that the women pilots were most active, and female pilots only ferried a total of 12,650 airplanes in their entire existence. If every single airplane ferried by women had been a fighter, they would have only accounted for 20%! In reality, the majority of airplanes ferried by women were trainers and light liaison aircraft. There was a period in mid-1944 when female pilots probably ferried around half of the fighters being ferried at the time, but the assertion that they ferried over half of the fighters delivered in the US is an obvious myth. Another myth that has been perpetrated in the hyperbole related to the WASP is that they were engaged in a hazardous occupation. In reality, their duties were routine. Ferry missions consisted of picking an airplane up at the factory or a maintenance depot and flying it to its operational base, or to a modification depot. Some women were assigned to perform "test flights," but they were simply acceptance flights of brand new airplanes or airplanes that had just come out of maintenance to insure that the systems worked properly. While pilots of tow planes were towing targets that were being shot at by inexperienced gunners, not a single female pilot was killed while towing targets. Twenty-six of the women who died either died while in training or died in trainer-type aircraft in accidents that today would be characterized as "pilot error." No women were killed in light training aircraft such as the Piper Cub which made up a large percentage of the aircraft they ferried. WASP hyperbole often claims that women performed missions on a wide scale when they were really single-case incidents. A WASP who was assigned to the research and development center at Wright Field flew a Bell P-39 jet fighter. Another was picked for a special project to fly a B-29 (with an all-male crew including an experienced instructor pilot) around to training bases because of the Superfortresses bad reputation. They were both isolated cases. WASP flying was exclusively within the United States and occasionally into Canada. The director of Ferrying Division, Brig. Gen. William H. Tunner, was impressed with the women under his command and sought to use them to the full extent of their abilities, including on overseas ferry routes. In September, 1943 Nancy Love and Betty Gilles, two of the most experienced female pilots assigned to ATC - Love founded the WAFS and was director of women ferry pilots while Gilles was her first recruit - were given a mission to ferry a B-17 to England across the North Atlantic route. A hand-picked crew - including Tunner's personal navigator - was assigned to the mission to support the two women on what would have been a history making event. The two female pilots set out from their base at New Castle, Delaware in the B-17, expecting to take the Flying Fortress all the way to Prestwick, Scotland. But when they got to Newfoundland, Love and Gilles were ordered to surrender the airplane to an all-male crew by personal order of General Arnold. Though Arnold gave the order, just why he did so remains unclear since he had previously given permission for the mission. 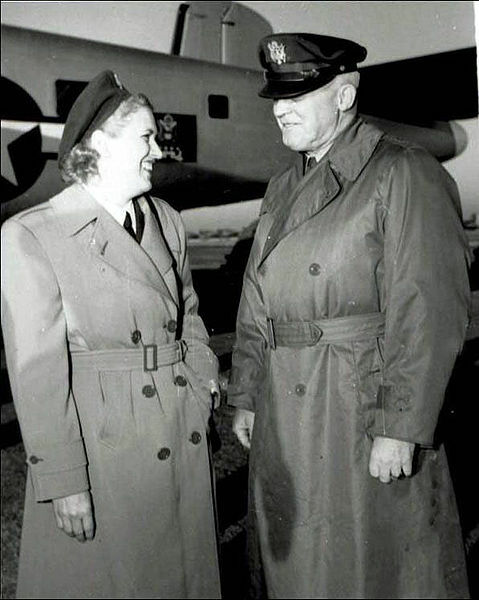 Many of the former WAFS pilots felt that Jackie Cochran put a halt to the mission because of personal jealousy of Nancy Love's experience and notoriety within the military. Cochran had flown her personal Lockheed Hudson to Scotland earlier, and some women believed that she did not want to be over-shadowed by Love. Others, those who came through Cochran's training program, thought Arnold was afraid of the possible exposure of the two women to interception by German fighters as they passed near the Norweigan coast. (Such an explanation is very unlikely considering that Norway is 500 miles east of the route from Iceland to the UK.) Whatever the reason for the cancellation, the two disappointed women returned to New Castle and no international ferry flights were ever authorized for female pilots and crews. Undoubtedly, the glamorization of the WASP was to a large extent responsible for their ultimate demise. The women were civilians and thus denied the military status of the male pilots who accepted military commissions as service pilots. A bill was submitted in Congress in September, 1943 to militarize the WASP but it failed to pass. 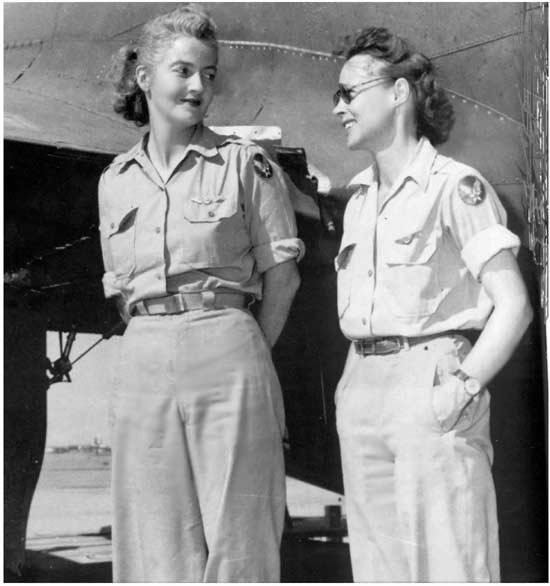 Cochran and General Arnold proposed the creation of a separate organization of female service pilots headed by a woman with the rank of colonel, but the War Department opposed such a move. No such organization existed for male service pilots. The USAAF felt that the women should be commissioned in the Women Army Corps, an organization made up of women who were already members of the military, many of whom were serving overseas in combat theaters and who were authorized to fly in military airplanes including duty as crewmembers. While Congress was still considering the bill, the Civil Aeronautics Agency's War Training Service program came to an end in January, 1944. College training programs and civilian-contract flying schools were scheduled to close, thus freeing large numbers of previously draft-exempt male flight instructors for military duty. The grounding of so many well-qualified male pilots and their possible reassignment to ground combat duties led to a feeling of indignation against the women pilots who were seeking military status. Simultaneously, as the war began to turn in the Allies favor, large numbers of returning combat pilots were available for ferrying, training and other duties then filled by WASP pilots. In June, 1944 a Congressional committee on Civil Service matters decided that the WASP program was unnecessary and unjustifiably expensive. The committee recommended that the recruitment and training of inexperienced women pilot trainees be halted but the women who were already employed as pilots were also affected. The final class of female pilots was allowed to graduate from Sweetwater on 20 December, 1944 but with their graduation the entire program was terminated. In addition to their role with the Ferrying Division, women were also used in Training Command and the domestic numbered Air Forces. In the summer of 1943 some women were assigned to target-towing duty training antiaircraft gunners. The women were judged better in the mission than returning combat pilots (primarily due to the ignorance of the women - the men had been shot at in earnest and knew what flak was all about!) In I Troop Carrier Command some women were assigned to fly tractors for glider practice. This was one area in which women proved inequal to the task due to the physical strength required to fly the Lockheed C-60s that were serving as tractors. Some women were trained as instructors; while they were not assigned to basic flight instruction, they served quite well in the instrument phase of training. By the inactivation of the program, WASP pilots had suffered 37 deaths, all to accident, while seven women received major injuries and 29 others incurred minor injuries while on the job. One other WASP pilot was killed in an aircraft accident while riding as a passenger. A footnote to the WASP story - As civilians, the female pilots were not veterans and were thus not eligible for benefits under the Military Readjustment Act. Of course, neither were the civilian male pilots, including those who flew overseas flights, sometimes over hostile areas, under military contract or with the airlines. In the 1960s as social issues became prominent, the WASP caught the attention of feminists, who began lobbying for veteran's status for the women. In 1977 they were granted this status, even though none had flown overseas. It was a status the more numerous male civilian pilots didn't even have! It wasn't until 1981 that male ferry pilots were recognized as veterans. Some airline employees who flew overseas missions under Air Transport Command contract weren't given veteran's status until the 1990s. The men - and women - who worked in the civilian schools that provided primary and other flight training have never been recognized as veterans. While the WASPS were in civilian status, large numbers of women served with the US Army Air Forces in World War II with full military status. The one group of women who shared the same dangers as did male aircrew members were the female flight nurses who flew with troop carrier squadrons in all of the combat theaters. For the first year or so of the war, no medical personnel flew on air evacuation missions, but the need was seen and a medical evacuation training school was set up at Bowman Field, Kentucky. By 1944 more than 6,500 nurses were on duty with the USAAF, of which 500 were on flight status in the air evacuation role. Flight nurses were selected from nurses on duty with the USAAF hospitals, and who recieved the recommendation of the senior flight surgeon in their command. After passing a flight physical, the women were sent to the School of Air Evacuation at Bowman Field, at Louisville, Kentucky for an extremely strenuous eight-week course. 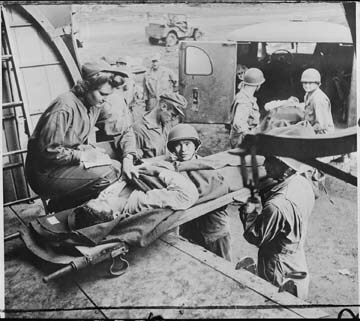 During the course the women learned how to load and off-load patients onto a transport while undergoing military training including survival skills, the use of parachutes, and simulated combat since the women would be required to fly into combat areas. Upon completion of their training, the women were assigned to air evacuation units overseas, where they flew as crewmembers aboard troop carrier C-47s operating into forward airfields on battlefields everywhere from New Guinea to Sicily, and later on the European continent. The use of female flight nurses exposed women to combat dangers that had never been experienced by American women as a group. Several were killed and a handful were captured and became prisoners of war. Their skill and diligence saved the lifes of hundreds of wounded GIs who would have died on the battlefield in previous wars. The Air WACs were an outgrowth of the Womens Auxiliary Army Corps, which was created in the aftermath of Pearl Harbor. Although they weren't officially designated as Air WACs, women assigned to Army Air Forces units were commonly referred to by that title. Originally, women in the Army served in an auxiliary status much like the WASPS, but in 1943 the WAAC was changed to the WAC as women were accepted into the Army with full military status rather than as an auxilary. From the outset of the WAAC program, the Army Air Forces was the one branch of the service most receptive to the use of women. At first the Air Corps wanted women to serve as aircraft warning spotters, a task at which they did exceptionally well. Until March, 1943 the USAAF's sole WACs were assigned to Aircraft Warning Service stations. As the war continued WACs were assigned to as many non-combat fields as possible, including aircraft maintenance, and in a few instances, aircrew duty on transport aircraft where they served as flight clerks, or flight attendants. Still, most women served in the clerical and administrative fields in which they had been trained in civilian life. At least 20 women were assigned to air crew duty - probably as flight clerks on executive transports - and there was at least one WAC crew chief during the war. Unlike the WASP pilots, AAF WACs served overseas, not only in civilized England, but in primitive New Guinea as well as North Africa, India and war-torn China and Italy. The presence of WACs in the overseas theaters led to improved discipline and courtesy among the male personnel with which they worked shoulder-to-shoulder. 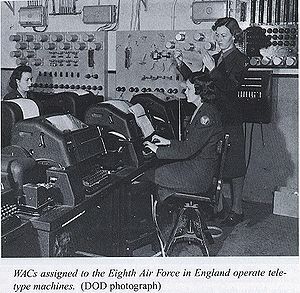 The Air Transport Command was a primary user of WACs, using women as parachute riggers, aircraft mechanics, radio operators and cargo and passenger processing technicians. Unlike WASPs, flight nurses and WACs were destined to become a part of the post-war Army Air Forces, and ultimately of the United States Air Force. In a report prepared at the end of the war, General Arnold reported that women in the jobs they were qualified to do were "more efficient" than men in the same jobs. As for flight nurses, their devotion to duty and efficiency established a place for them with the post-war Air Transport and Troop Carrier Commands. Click Table of Contents to return.